The main players in the CAMS Australian Targa Championship will lock horns in the season-opening Targa North West this weekend (February 16-17). 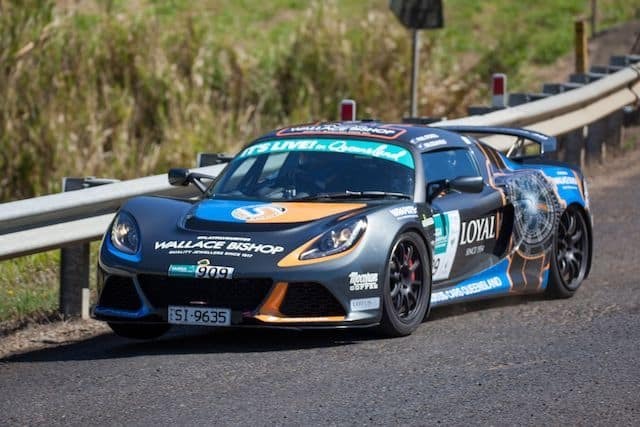 After prevailing by a mere eight points to win the inaugural modern title in the Championship last season, Paul Stokell returns in his revised 2014 Lotus Exige that has proven to be fast and reliable against more powerful machinery. The highly decorated former circuit racer will be joined by new co-driver Kate Catford. Stokell was forced to use three different co-drivers last season with Catford replacing Kiwi Malcolm Read who called the notes for the Queensland-based driver at Great Barrier Reef and High Country. Intent on redemption after being forced into retirement at Targa North West last year, locals Jason and John White are heavily favoured to turn the tables in outright and GT2 classes in their 2016 Dodge Viper. The Whites are attempting to win four events on the bounce after winning Targa Tasmania, Great Barrier Reef and High Country following their premature Targa North West departure. Other runners to look out for in the GT2 ranks are Peter Nunn and Keith Johnstone (2016 Porsche GTS), Michael Pritchard and Adam Butler (2016 Porsche GT3 RS and John Ireland and Janet Binns (2017 Dodge Viper). The GT4 class is dominated by Subaru with Crichton Lewis and Steve Glenny’s 2015 WRX STI one of the highly fancied runners along with the 2008 STI Hatch crewed by Ralph and Malcolm Norton. Classic handicap honours will see a tight battle between the 1985 BMW E30 325 of Peter Gluskie and Samantha Winter and the 1975 Fiat Abarth of Nik Prieston and Dylan Braithwaite. In Classic GT, the 1979 Holden Commodore VB of Mick Downey and Jarrod Van Den Akker will take a power of beating. In Early Modern, Jon Mitchell and Anthony Carr will prove a force in their 2006 Subaru S204. Past Targa Tasmania winner, Tony Quinn, will be a threat in his Porsche 996. The class has drawn a couple of Porsche Caymans with Paul and Kathy Henry sharing the #837 entry while Kingsley Wallman and Ellen Witte will crew the #874 Cayman S.
Early Modern will also feature some American muscle with the 2007 Chevrolet Corvette Z06 for Jordan and Debbie Bridge. In GT Sports Trophy, a pair of nimble Lotus Exige machines will do battle. Tony and Sandra Seymour will campaign a 2013 Exige while Mitchell and Darryl Ringuet will handle a 2017 Exige Sport 350. Thoroughbred Trophy will see an diverse range of machinery with Geoff Storr and Steve Caplice return in a 1978 Alfa Romeo Alfetta GTV . The oldest car in the class will see a 1961 Ford Anglia handled by Martin and Christopher Bulk. TSD Trophy regular front-runners Peter and Tristan Taylor are highly fancied to take honours in their 2013 Lotus Elise S.
Targa North West based out of Burnie features six stages on Day 1, Saturday February 16, which kicks off with the short 3.79km Montumana blast with the lunch stop at Stanley. Day 2 on Sunday will close with the fourth repeated run through the time-honoured Hellyer Gorge pass that stretches just over 20.60km.